If you want the kids to have some fun then this Printable Valentine Game is the answer. I love keeping children entertained with simple holiday themed games. This Printable Valentine Game is perfect for boys or girls. 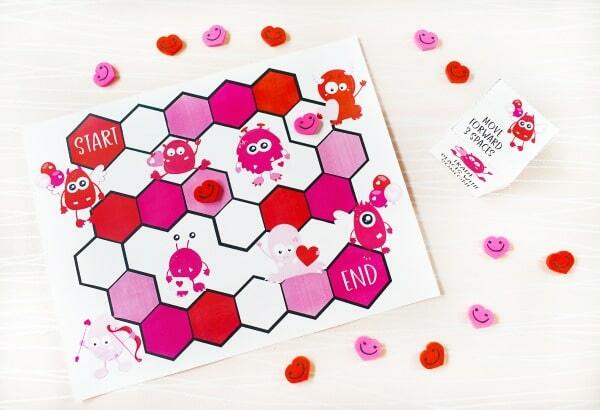 The game board has all of the traditional Valentine’s Day colors of reds and pinks. 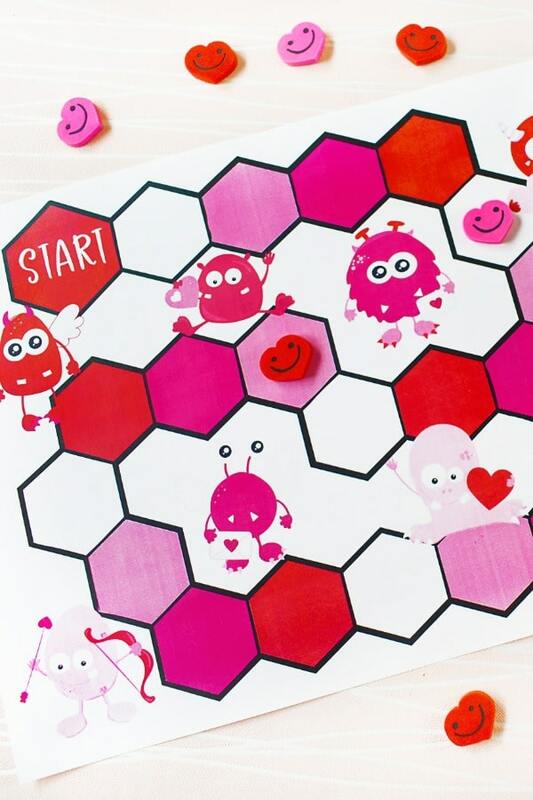 The addition of fun little Valentine’s Day themed monsters bring a fun aspect to the game board that makes ALL kids want to play. It can be hard to find activities for school holiday parties. No one wants to purchase 4 or 5 store bought board games so that small groups of kids can play. That would get expensive fast! This Printable Valentine Game is the perfect answer. Print off multiple game boards and then small groups of kids can all play at the same time. I love themed parties and a monster-theme is super fun for Valentine’s Day! I like simple games. Easy games are just as fun and we don’t have to spend a lot of time trying to explain the directions to impatient kids. The first step to playing this game is to print off the game board. I like to print mine off on white cardstock so that it is sturdy and we can reuse the board over and over again. If your kids like board games as much as mine do then you will want to laminate the game board! 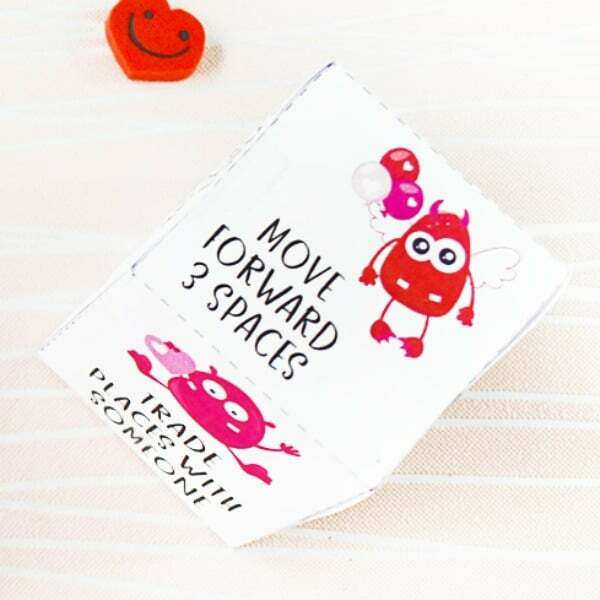 Part of the Printable Valentine Game is the dice. The dice is easy to put together. Cut the dice out by cutting along the solid lines. Fold along the dotted lines and put it all together to make a cube. Use a little bit of tape to secure the final side. Each player will need a game piece. You can get creative or use whatever is handy. The important thing is that each person’s game piece can be identified from the other game pieces. A few ideas of things you can use around the house: buttons, coins, small toys like Shopkins or erasers. The game is played by each player taking a turn rolling the dice. Follow the directions listed on the side of the dice they roll. The player to reach the end of the game board first wins! The dice has different directions like move forward, move backwards and even change spaces with someone else! You can download and print off this Printable Valentine Game and use it for your own personal use. 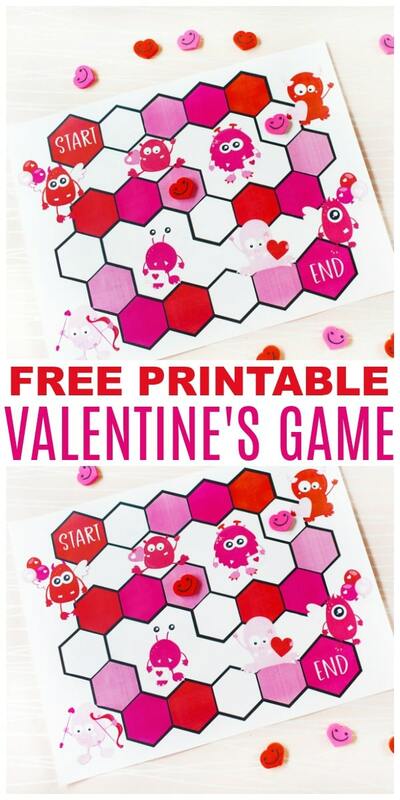 Don’t forget to SHARE this fun Printable Valentine Game with your friends! This is so cute! I really think my girls will enjoy playing this. I love that we can share a day that most people dedicate to their spouse, with our whole family! Thanks for sharing. Awesome. Thanks for sharing at To Grandma’s House We Go DIY, Crafts, Recipes and More Link Party. I pinned this! Hope to have you join again next week. Have a great day! Hey Marine! Cute printable and thank you for the freebie! My kids are into games now that they are 4 and 5 years old. Thank you for sharing at #OMHGWW and hope to see you next week!